Thank you for visiting my blog. May the 2011 year ahead be a special year for all of you. I wish you happiness, peace, joy and love. Don't forget your new years resolutions and spending time with your loved ones and those special to you. 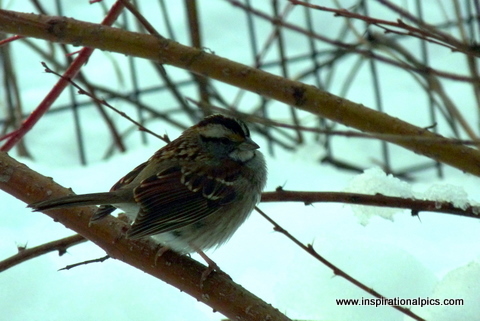 This little bird was perched so peacefully in the branches. I almost didn't see him as I strolled through the park in NY. 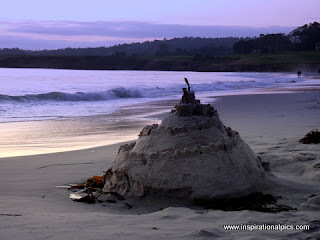 Sand Castles do not last forever but they can leave an everlasting memory especially for those who created them. In the distant background at the top of the picture you can catch a glimpse of a couple strolling on the beach just below the Pebble Beach golf course. This happens to be one of my favorite photographs and receiving compliments from customers about it are gratifying. This print was recently ordered in a Lustre finish, and enlarged to a 24" x 36". My customer informed me that he used a custom frame retailer to frame the print in black metal with a white linen mat for a bold finish! 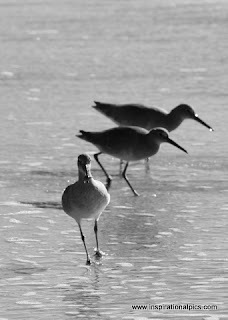 Shore birds seem to be always on the move searching for the right time to gather up their next meal. These birds were looking for sand crabs. If you look closely, the bird in the foreground found one.